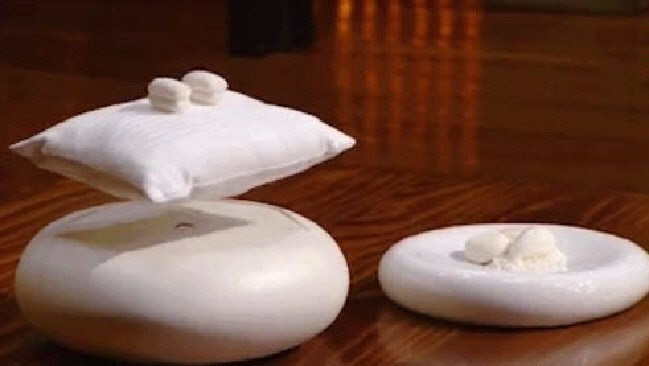 MasterChef's impressive 'floating pillow' dessert. FAMED for his showstopping dishes, celebrity chef Heston Blumenthal didn't disappoint during last night's MasterChef finale, challenging the finalists to recreate a dessert he'd invented that seemed to defy the laws of physics. Dubbed 'Counting Sheep', Blumenthal's 'floating pillow' was just that - a pillow seemingly floating and spinning in mid-air, atop which sat two small, perfectly formed meringues made from coconut ice cream with a steamed sponge and panna cotta.